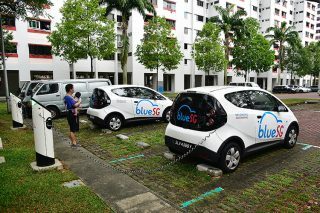 There are those who will tell you that a vehicle is but a tool of transport. They will turn their nostrils up, sharply exhaling, lips curled in a condescending smile as they smugly inform you that for that kind of money, you could get more doors, more metal, more dead-cows. You could get an apartment, actually. Do not listen to them. For what you are getting is not just a means of going to work and back, with a little leftover space for one passenger and a bag. 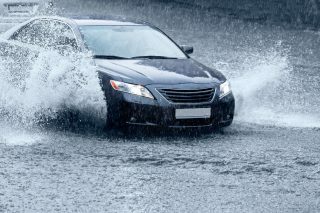 With two-door sports cars you venture into irrational waters, in search of sweeter birdsong and a brighter palette for every second of your day, even when you are not driving. You are buying, with your executive-flat money, trembly knees and a fluttering feeling in your heart. Whoever said money cannot buy happiness told a fib. Porsche 718 Cayman cockpit is solidly constructed and perfectly supportive of the driver. For five glorious days, I had a Jaguar F-Type and Porsche 718 Cayman as My 2-Litre Sports Car. First, the feline temptress from Great Britain. I love, when I feel the key bulge in my pocket, the way my mind tingles with the joy of knowing I have a Jag coupe waiting for me. I love the stunning British Racing Green hue, so deep and luscious it could hide entire galaxies as my eyes fall upon her in the carpark. I love the long, graceful arc of the bonnet as it crests above the front wheels before sweeping over the cabin and sharply truncating at the saucer-like rear. And I love the pulsating start button. The Jaguar F-Type is all sublime drama and seduction, and it is hard for me to hold back a tidal wave of affection before a 19-inch alloy wheel is even turned in anger. Good thing, then, that the affection does not wane even in the slightest on the inside. The Jaguar F-Type is the first proper sports car from Jaguar in a long time – smaller in size and more focused in remit than the long-legged and relaxed XK. Still endowed with immense cross-country ability and intended to pamper as much as excite, the Jaguar F-Type cradles its occupants like the thick embrace of a softball glove. Jaguar F-Type cockpit pampers, excites and delights. Jaguar couldn’t resist installing its surprise-and-delight flourish of motorised air-con vents, and they sit atop a dashboard of much flair, arranged to wrap itself flamboyantly around the driver in gorgeous, asymmetrical sweeps of copious leather and chrome. 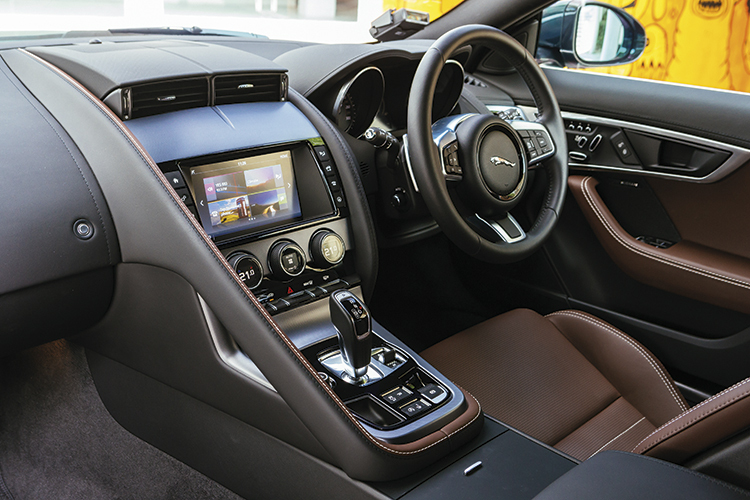 Jaguar’s newish infotainment system exhibits a hesitancy of response that would be annoying, if not for the fact that you did not buy your sports car to waste time on gadgetry. In keeping with this theme, the absence of a digital instrument cluster in deference to two crystal-clear analogue dials, unpretentiously reporting revolutions and speed symmetrically in the best sporting tradition, is no bad thing in a coupe awash in classical sports-car overtures. This is a triumph of a cabin, with surroundings of incredible plushness and substance. While the quality of the accommodation is hugely satisfying, it hints at a carelessness with weight that finds the Jaguar F-Type bruising onto the scales at 1525kg – an alarming amount compared to the positively featherlike 1365kg Porsche 718 Cayman. Motorising the tailgate in a car this size is an indulgence so curiously unnecessary that it would give Colin Chapman an aneurysm. Thankfully, this heft proves easily manageable by an engine Jaguar describes as the most powerful 2-litre it has ever produced. 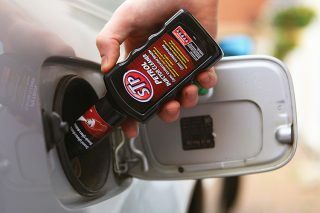 The 4-pot lump up front also makes the car a useful 52kg lighter than the 3-litre V6 version. There is no shortage of panache here, nor is there any deficit in decibels, even if the aural character is recognisably from a 4-cylinder. 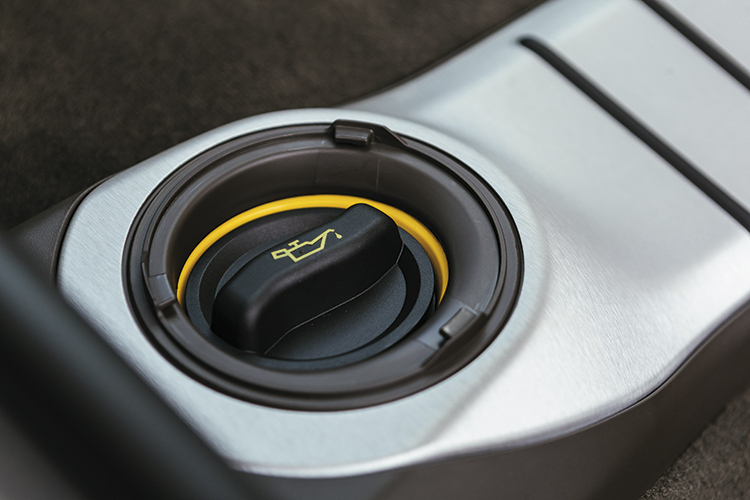 More importantly, this powertrain has the requisite urgency you need for any passing manoeuvre or sudden enthusiastic bolt at anything above 2000rpm. Even if it does not mimic the sensation of being shot out of a cannon as violently as the Porsche 718 Cayman’s electrifying motive verve, a 0-100 century sprint of 5.7 seconds delivered with consistent and gathering urge is nothing to be sniffed it. The Jaguar’s rev limiter catches me by surprise once or twice, and I could argue that the Jaguar F-Type’s 6500rpm redline, compared to the impressively stratospheric 7400rpm of the Cayman, is a numerical disappointment. 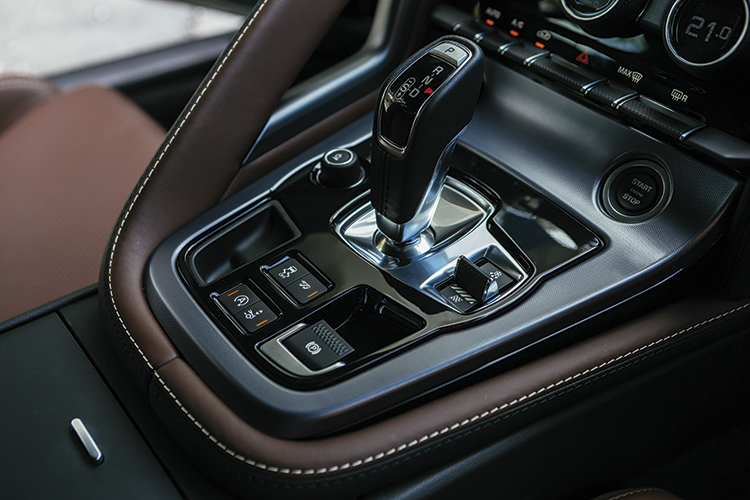 In reality, however, the Jag gives you more opportunities to pull the gearshift paddles and bung it gratuitously up and down the highly effective 8-speed gearbox. Jaguar, along with British automotive culture, seems to subscribe to the romanticised notion that the true mark of skill in a gentleman racer is the capacity to go sideways. Hence, the Jaguar F-Type feels best when driven sideways. It’s a typical Jaguar trait – even the brand’s family-friendly XE and XF saloons egg you at every opportunity to slide the rear out and toss in some opposite lock. Endowed with the smaller engine’s relief of weight over the front axle, the front end bites with alert authority. Unlike many other less well-resolved pretenders to exuberance, however, the cat’s tail is always moving in confident tandem. 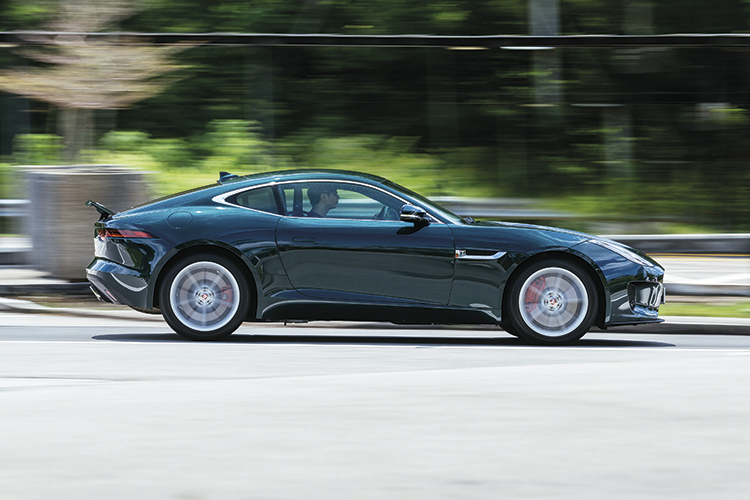 Longitudinal and lateral weight transfer is always fluidly measured and telegraphed, and this Jag rotates confidently and faithfully at speed. 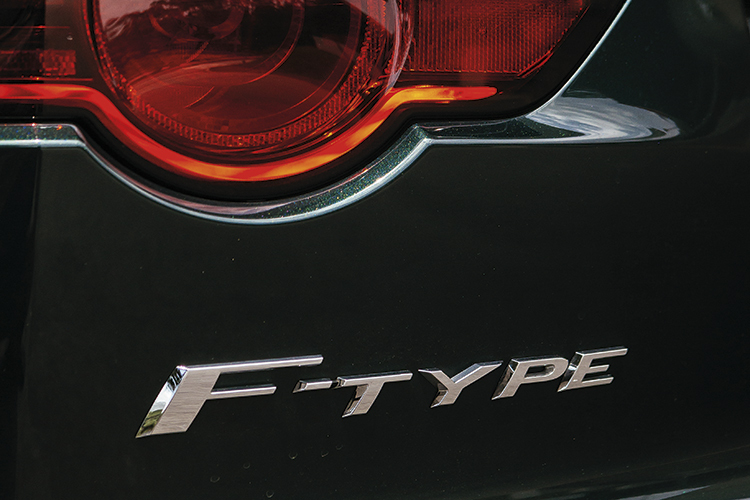 The Jaguar F-Type is ever the willing and forgiving partner in the endeavours of mischief. Chamfering off potholes and patchy road repairs with uncanny sympathy, the Jaguar F-Type uses its pliancy to not only maintain authority in trying situations, but also to soothe and cosset when the going is less violent. 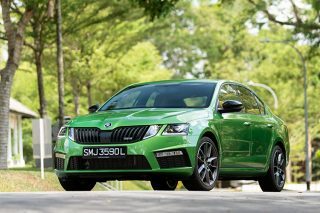 When the fun and games are over, I could see myself on holiday in the south of France in this car. 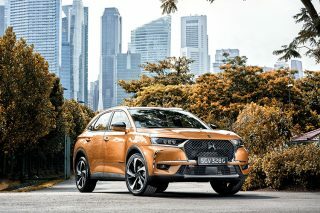 With ride and handling so beautifully sorted, there is always abundant evidence of the company’s towering skill in chassis tuning and delicacy of mechanical touch, despite the prodigious weight. 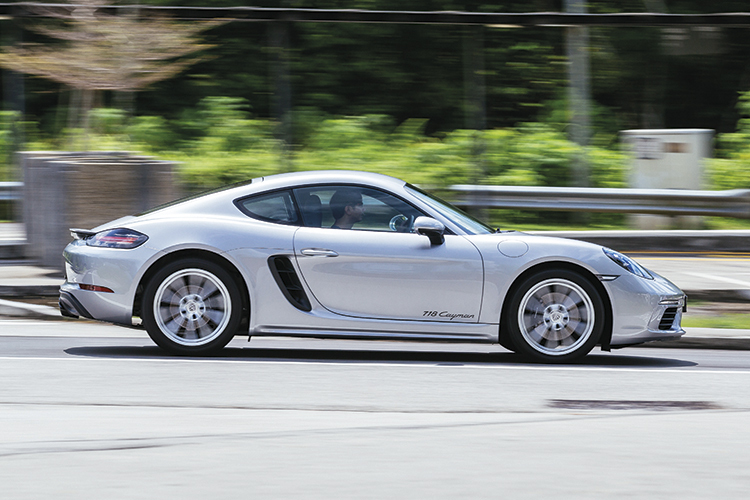 But, unequivocally, the Porsche 718 Cayman is the better thrill machine. I will not spend much time, as nicely detailed and attractive as it is, on the aesthetics of the car, except to say that without a single sharp edge it looks like a pebble, massaged into flowing smooth lines by centuries of lapping water. Perhaps because of familiarity, the Porsche 718 Cayman’s functionally beautiful shape attracts not quite the same level of envy that the Jaguar F-Type does. So, if attention-seeking vanity rather than knowing-kudos is your priority, the Porsche 718 Cayman may feel a tad understated. The interior is similarly no-nonsense, with the German brand’s unflappable solidity of construction manifested with a flurry of white-on-black buttons plus a perfect driving position with clear sightlines minimally obstructed by thin A-pillars. 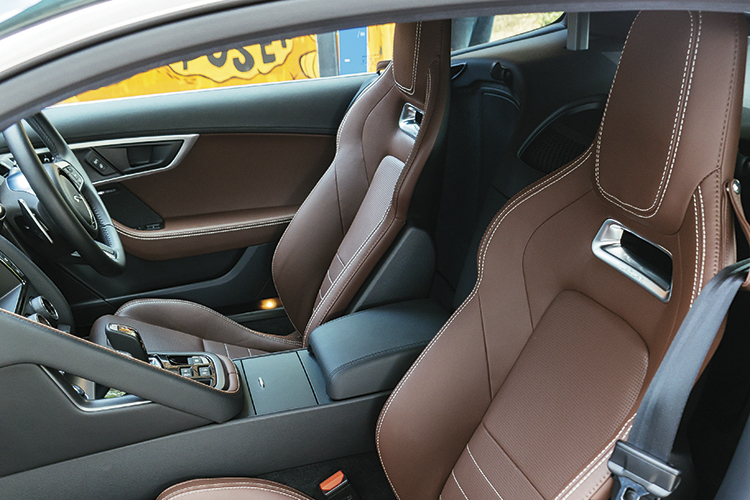 Your buttocks are held securely in place by the dark grey upholstery of a body-sculpted sports seat. Even an MX-5 has a cubby for your phone, this car does not. I get the message. Putting the Porsche 718 Cayman in sport mode and the exhaust in loud mode, it’s time to drive. Porsche 718 Cayman’s mid-mounted 2-litre engine is powerful and purposeful. Say what you want about the considerable talents of the Jaguar F-Type, the Porsche 718 Cayman deserves every ounce of its Marianas-trench-deep reputation for being the definitive zenith of small sports car-dom. It feels like a rocket-powered fly. 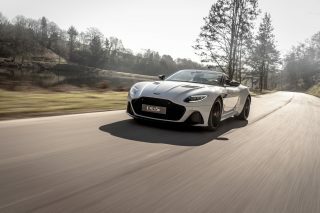 Which means on the tight and unforgiving confines of South Buona Vista Road, or even carving through regular traffic, it feels blessed with greater alacrity than the Jaguar F-Type’s richly syrupy and viscous approach. A tightening-radius right turn beckons, with alloy-destroying high kerbs on either side. I am unfazed. Titrating the exact amount of power, I carve a Cayman incision precisely through the bend, winding lock off as the chassis vividly communicates the precise amount of resistance the front wheels are pushing against. About that steering. If there is an electrically, or even hydraulically, assisted system out there with greater feel and accuracy, I have not come across it. 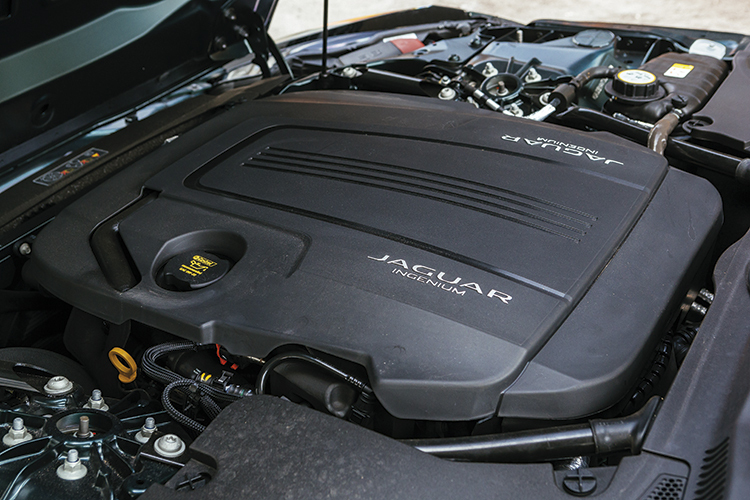 Jaguar F-Type’s front-mounted turbocharged 2-litre has panache, loudness, the necessary urgency and a great gearbox. With absolutely no dead spot and the perfect amount of self-centering, it brings a complete absence of that treacly, elastic gloopiness that afflicts, even to a tiny degree, every other steering system out there. It feels as meaty and satisfying as biting down on a perfectly medium-rare steak. And that is just one control interface. Everything else speaks to the driver with the same utmost clarity, the kind that makes placing the Porsche 718 Cayman on the road exactly where you want it an act of instinct. Then I discover a series of flowing bends. Instructive thoughts burst into my head and I find myself muttering “brake here… lift off slightly… just a bit of lock… aim for the apex”. That’s only because all my nerve endings are ablaze with flavour and wonderfully instructive information. It is like being personally coached by Usain Bolt himself on the nuances of going fast. The Porsche 718 Cayman is the better thrill machine and feels like a rocket-powered fly, whereas the Jaguar F-Type is all sublime drama and seduction, with beautifully sorted ride and handling. I just wanted to go again and again and again, each time feeling my way with my fingertips through a subtly different approach – with the line, with the throttle, with the brakes or steering input, to experience the tapestry come together in explosions of deep sensual pleasure. The sense of control in the Porsche 718 Cayman is immense and utterly, absorbingly addictive. And oh, what an engine. The Porsche 718 Cayman was first to the 4-cylinder party, and it has a motor of phenomenal ability. All snarls and gnarly metallic rasps, it sounds like the Bismarck’s anti-aircraft batteries have erupted behind you. 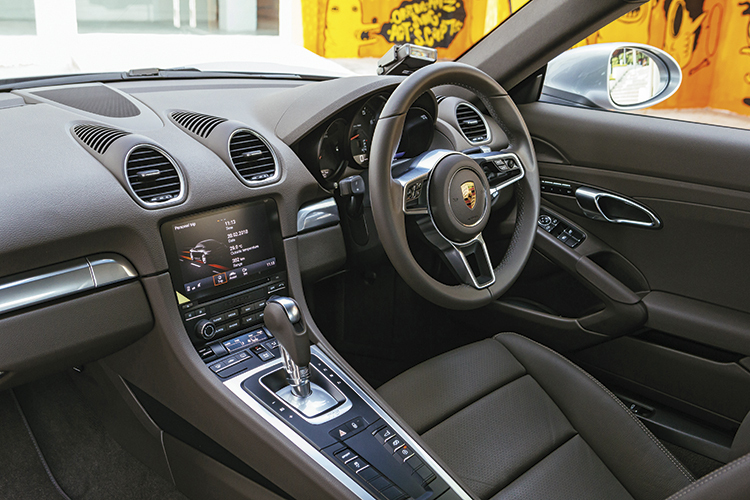 There is absolutely nothing to complain about regarding the quantity and quality of the Porsche 718 Cayman’s power delivery, perhaps only that the chassis is so good it will handle much more violent power with ease. If I had to criticise anything about the Porsche 718 Cayman’s demeanour, it is that the Porsche takes itself very seriously, without, say, an MX-5’s bouncy, effervescent sense of humour. But that would be nitpicking of the most petty order. The Jaguar F-Type is perfectly balanced, multi-dimensional and more comfortable, but it drives bigger, heavier and less incisively than the Porsche 718 Cayman. 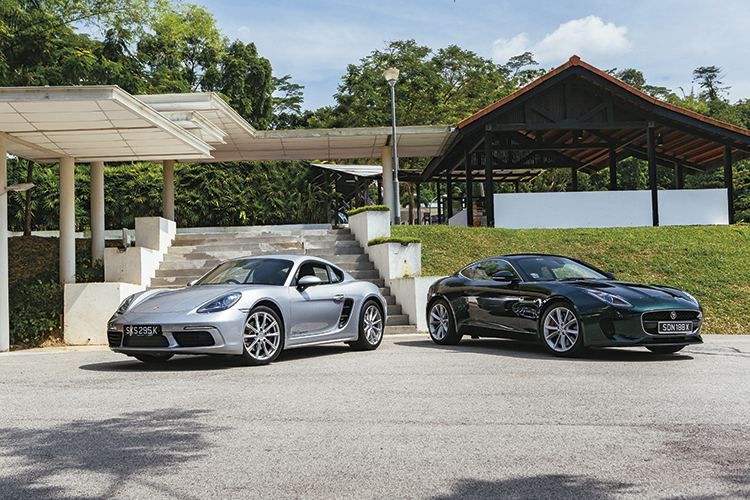 The Jaguar F-Type is no doubt expertly balanced and multi-dimensional, and the Porsche 718 Cayman is not in the same league in terms of comfort. But the naked truth is that the Briton, for all its good old-fashioned honesty, drives bigger and heavier than its German foe, pouring itself down the road more luxuriantly and less incisively. Those of us who grew up with or are currently enjoying literary exploits with Pilot G2s will be well aware of the difference between the 07- and 05-spec pens. The question then presents itself – do you want a fantastic grand-touring sports coupe, or do you want a transcendent driving experience? 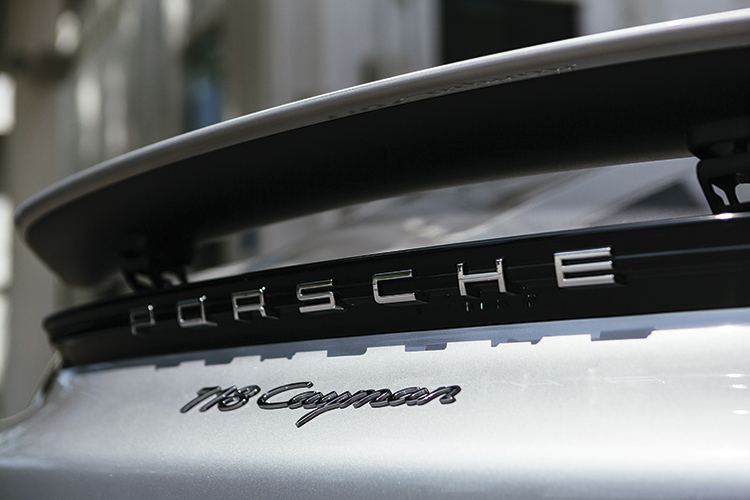 The Porsche 718 Cayman is the definitive representation of its breed. 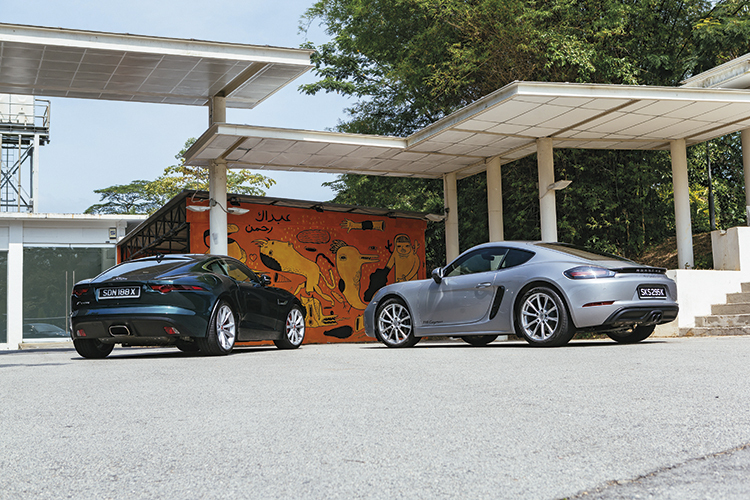 Until the Alpine A110 turns up in Singapore to challenge the Cayman’s crown, it is the champion small sports car built first and foremost to entertain and absorb its driver. Just as Obi-Wan Kenobi so articulately describes a lightsaber, it is an elegant weapon for a more civilised age. Jaguar F-Type is stunning, especially in British Racing Green, and attracts envious eyes, whereas the pebble-like Porsche 718 Cayman looks functional.